Freezers require regular maintenance, just like all the other appliances in your home. Here's what you need to do to make sure your freezer last for years, and continues to run efficiently. Vacuum the condenser coils. When dust accumulates on the coils, the condenser has to work a lot harder to maintain the proper temperature. That translates into bigger electric bills, and a shorter life for your overworked freezer. To avoid these problems, give the coils a thorough cleaning every three months (monthly if you have one or more furry indoor pets). You'll find the coils on the backside or the underside of the unit. Just unplug your freezer, and vacuum them off. It's as easy as that. (Be sure to plug your freezer back in when you're done, so your food doesn't thaw). Defrost your freezer. If you have a manual-defrost freezer (i.e. a chest freezer), you need to defrost your freezer any time you have a half-inch, or more, of ice build-up on the interior walls. This will ensure your freezer runs efficiently, and it'll keep you from losing freezer space to ice. Transfer your frozen foods to another freezer, or several coolers, while you're defrosting your freezer, so things don't thaw out or go bad. Learn more about how often you should defrost your freezer for optimum performance. Clean the drain hole and pan. 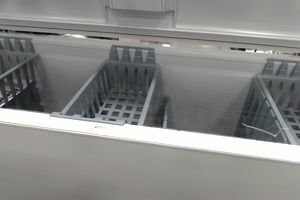 If you have a self-defrosting freezer (most upright freezers are), you don't have to deal with the chore of defrosting your freezer, but you do need to keep the drain hole clear, so the unit can get rid of the water from its daily defrost cycles. To tackle this task, unplug your freezer. Then, locate your freezer's drain hole, and clean out any mineral deposits or gunk that may be clogging it. While you're at it, take a minute to wash out the drain pan. Repeat this process every three months, so you don't develop any clogs. Check the seal. A tight sealing door helps your freezer to maintain a constant temperature without having to work too hard to do it. Inspect the rubber gasket on the door for any cracks or damage that could prevent it from making a good seal. Then, shut a dollar bill in the door, and see if you can pull it out easily, if you can (or you found damage during your inspection), it's time to replace the gasket. Just do a web search for your fridge model and "rubber gasket." That should turn up several sources for a replacement. If the gasket is still good, just give it a quick cleaning to remove any dirt or stickiness that may prevent it from sealing properly. Wipe it down. Protect the finish on your freezer by wiping the exterior down regularly and cleaning up any spills as they happen. It's a small thing that can greatly extend the life of the paint. Be sure to plug your freezer back in after performing all of these maintenance tasks. As long as you keep the freezer closed while you work, the food inside should keep for up to 48 hours, so don't sweat it, if you need to unplug it for an hour or two. Keep your freezer a good distance from the wall, so it doesn't overheat. Consult the owner's manual that came with your freezer, for specific space recommendations. Try to keep your freezer full. It'll maintain its temperature better, and ensure the condenser doesn't have to work too hard. Schedule your freezer maintenance on your calendar, or set a reminder in your phone, so you don't forget to stay on top of it. Always finding lots of freezer-burned food in your freezer? Here are some simple things that you can do to prevent freezer burn. It takes a lot of money to stock a freezer with food. Protect your investment by printing a copy of these instructions on how to keep your food safe during a power outage. Store it somewhere you'll remember (perhaps on the side of the freezer), so you'll be able to refer to it, even when the Internet is down.